The Arctic matters and, being a "near-Arctic state", China is fully engaged in its affairs. This is in stark contrast with the United States, an Arctic Council member, which has shown little interest in the region and the European Union, perhaps because it is not even an Arctic Council observer. China, by the way, is an Arctic Council observer. 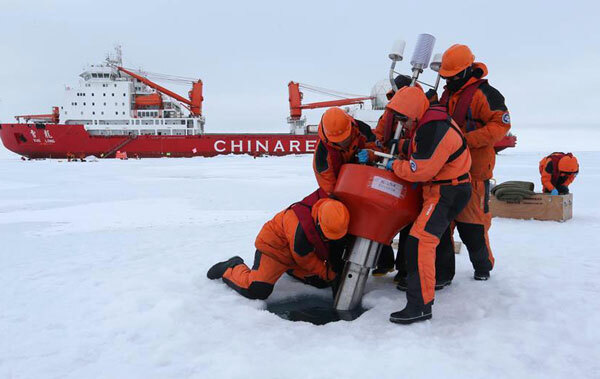 China has a clear Arctic policy, which was explained in a White Paper issued in January 2018, which ties in well with the concept of a "Polar Silk Road". Thanks to global warming, Arctic ice is melting, opening up the possibility of a "Northern shipping route" via the Northwest, Central and Northeast passages. Shipping time between China and Europe via the Arctic would be shorter than the existing one through the Indian Ocean and Suez Canal. Although this does not mean the "Northern route" would replace the established ones, it would represent a new opportunity, particularly in the trade of energy and minerals. The thinly populated island-state of Iceland, for instance, is rich in clean energy, a fact which has drawn China's attention. In 2018, Sinopec Green Energy signed a deal with Iceland's Arctic Green Energy (apparently the biggest deal in Iceland's history) to supply to China geothermic energy, which is clean and helps reduce pollution. Research and exploration in the Arctic are fundamental to understanding and tackling climate change issues. With the melting of Arctic ice, the polar region could provide an opportunity to better understand the effects of global warming. At the same time, the polar region－particularly the Russian part of the Arctic－has a huge reserve of energy, which should be extracted according to international environmental law. The region of Yamalo-Nenets in Western Siberia is home to slightly more than half a million people, but it has about 90 percent of Russia's gas and a substantial share of its oil reserves. More oil and gas are available further North, in offshore fields. According to US estimates, 30 percent of the world's undiscovered gas and 13 percent of its oil could be found in the Arctic region. Considering the Western sanctions against Russia, therefore, Beijing is in an ideal position to further strengthen its partnership with Moscow in this field. The Yamal Liquefied Natural Gas plant is a huge infrastructure project on the mouth the Ob River in Northwestern Siberia, where winter temperatures drop to minus 50 degrees Celsius. Yet gas from Yamal is liquefied and can reach Chinese ports in about two weeks, half the time required to ship gas from the Middle East via the Suez Canal to China. The plant started operation in 2017, with Russia's Novatek holding 50.1 percent stakes, China National Petroleum Corporation 20 percent, the Silk Road Fund 9.9 percent and France's Total 20 percent. Novatek is giving healthy competition to Gazprom, the dominant market player, and it specializes in extracting fuels in the Yamal region. Ernesto Gallo is an honorary research associate at University College London, and Giovanni Biava is an energy and gas consultant at Exelen group. The views do not necessarily reflect those of China Daily.